It’s pickleball, and it’s the newest medal sport in the National Senior Games. 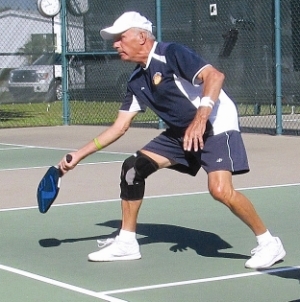 “It’s a family game,” said David Jordan, president of the USA Pickleball Association. “You can play it anywhere, you can play it in your driveway, if you want to. It’s just a great game. Exercise, and not nearly as taxing on your body as a lot of other racquet sports. 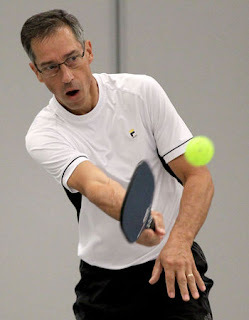 Jim Cetlinski, 59, of Summerfield, FL, returns a shot in his mens doubles pickleball match during the National Senior Games in Cleveland, OH, Monday, July 29, 2013. Two of Tanglewood's pickleball players have reflected on the impact these games are having on them. "The Celebration of Athletes was held in the arena where the Cleveland Cavaliers play. It was amazing, awesome, cool, but most of all, inspiring. Scott Hamilton was a great emcee," Tom Stadler said. "Two representatives from each state marched in the Parade of Athletes carrying their state flag. We all recited the Oath of Athletes then inspirational stories of athletes who overcame health issues to achieve success were shown. 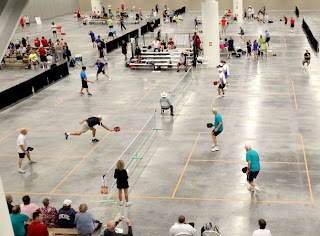 The evening concluded with the passing of the flag to Minneapolis, St. Paul, who will host the next Senior Games in 2015."